Manage guest checks more efficiently. The Focus POS multi-check dashboard allows the user to easily move from check to check with a tap of the finger. Repeat a round of drinks on one check, split another, and print a third check – all without exiting the dashboard view. The currently active check is highlighted yellow for easy viewing. The global-centric view of the dashboard puts all of the user’s checks within one, easy-to-navigate display. The command ribbon on the right of the dashboard is custom configurable, allowing the inclusion of common functions used by the establishment. Use the scroll bar to access up to 30 commands and functions. Common functions include repeat, delete, print, and split – however, virtually any command or function available in Focus POS can be assigned to this ribbon. Easy. Fast. Powerful. Your employees will love you. Running individual reports are a thing of the past when using the nFocus Dashboard. Spend more time running your business, not your reports. The nFocus Dashboard provides an overview of the restaurant’s operations and has extensive drill down capabilities that display detailed information. System alerts provide vital statistics about the status of your system. 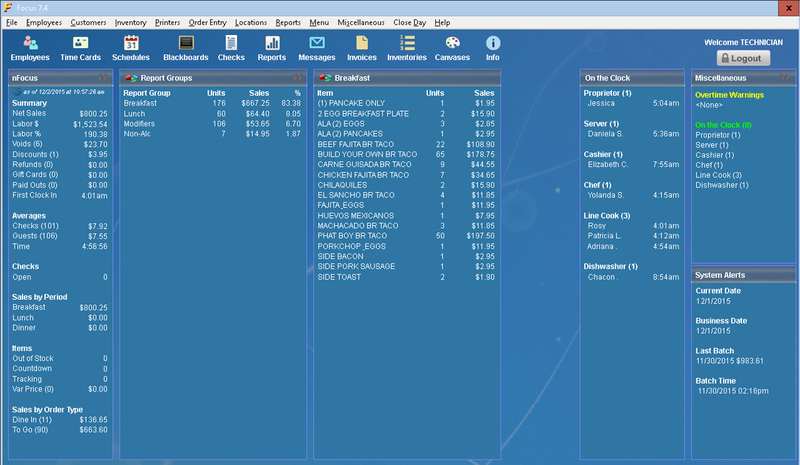 Business date and batch information is shown at a glance, as well as credit card, special pricing, and printer statuses. Critical employee information is displayed in one, easy-to-manage view. Employees who are on the clock or are approaching overtime are displayed, giving management real-time data in order to make informed decisions. Some of us are visual learners. With one-click, effortlessly turn sales and labor statistics into 3-D colored graphs and charts for easy performance analyzation. Interactive InformationWith the comprehensive drill down features available in the nFocus dashboard, attaining detailed sales and labor information has never been easier – point, click, go! With all necessary information at the tips of your fingers, the nFocus dashboard makes it easier to operate your Focus POS system than ever before. One-click icons allow quick and convenient access to commonly used functions such as employees, time cards, and sales figures. Labor and sales reports can quickly be turned into graphs in order to visualize your restaurant’s operations and analyze the business’ performance throughout the day. The nFocus customization options allow you to streamline the dashboard’s view with your specific preferences. Certain figures can be included or excluded from the dashboard, and you can even specify individual items to track – all within one, interactive view. The customizable nFocus dashboard gives you the ability to get detailed, real-time information about your business in a snap of the fingers.